FQB "Bellissima" Collection draws you in with its romantic and cottage chic appeal. 3 Bicycles with baskets on the front filled with a lush floral bouquet....imagine the places you'll go! 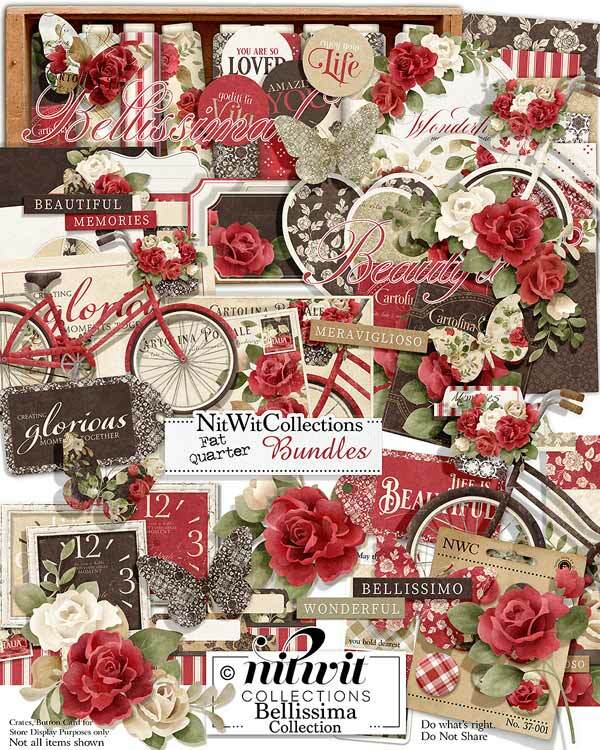 1 Inspiring corner cluster with a tag - "Creating Glorious Moments Together"
1 Event card with writeable areas for the day, place and time - "Creating Glorious Moments Together"
4 Journal mats - some more plain and some more intricate....which one suits your project? 4 Blank journal strips for you to write in your sentiment, date, name, etc. 1 Phrase circle - "Enjoy Your Life"
1 Phrase circle - "Amazing You"
1 Phrase circle - "You are so Loved"
1 Phrase circle - "Goditi la Vita"
1 Digital stamp sentiment - "Beautiful"
1 Digital stamp sentiment - "Bellissima"
1 Tag in black and white - "Creating Glorious Moments Together"
1 Tag in red and white - "Life is Beautiful"
5 Word labels that are filled in for you....do they evoke everything you'd like to say? ?